While everyone was looking at the lambda expression and Stream API, JDK quietly sneaked some of the exciting methods on its API. There are a lot of hidden gems on JDK 8 and I have uncovered many of them already in this blog and today we'll talk about one of such gems which you can use in your day to day programming activities like joining much String together. The Java 8 has added a new class called StringJoiner to join Strings. The java.util.StringJoiner can be used to join any number of arbitrary String, a list of String, or an array of String in Java. You can choose any delimiter to join String like comma, pipe, colon or semi-colon. This class also allow you to specify a prefix and suffix while joining two or more String in Java. 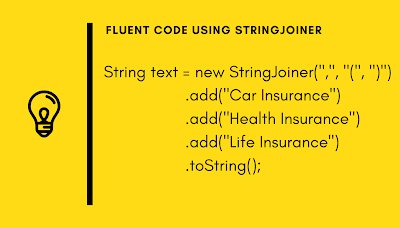 In order to join Strings, you first create an instance of StringJoiner class. While creating the instance, you provide the delimiter, a String or character, which will be used between Strings while joining them like you can pass comma as a delimiter to create a comma separated String or pipe to create a pipe delimited String. In this article, you will see some examples of StringJoiner to learn how to join String in Java 8. Some of the readers may be curious why do you need a new StringJoiner class if you already have StringBuffer and StringBuilder classes to concatenate String, which is nothing but joining. But, StringJoiner provides much cleaner and capable interface to join Strings. You don't need to write logic to start adding comma only after the first element and not to add after the last element, which Java programmers used to do while joining String in Java 6 or JDK 7. Though StringJoiner is just one of the hidden gems of Java SE 8 release, there are many more day to day useful features which are hidden behind lambda expressions and streams like CompletableFuture. 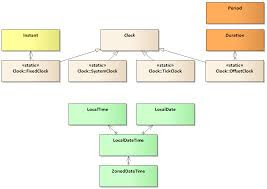 You can further see What's New in Java 8 course on Pluarlaishgt to learn more about those useful features in quick time. Let's see our first example, which will join String by a comma to create a CSV String in Java 8 using the StringJoiner class. In this example, we join arbitrary String like Java, C++, Python, and Ruby to form a comma-separated String. You can see that StringJoiner has joined all String you have added to it. You don't need to loop through a list of String anymore. This code may look very similar to the code you may have written using StringBuffer but StringJoiner is very different from StringJoiner. In case of StringBuffer or StringBuilder, you need to explicitly call the append(",") to join String by a comma but, here, once you tell StringJoiner about delimiter you are done. No need to call any function or write special logic, except adding String. You can see how you can join multiple String in just one line using StringJoiner and fluent API. If you are new to fluent API and interested in writing your own, you should check Fluent API Design - A Crash Course on Udemy which talks about a software architecture approach for creating readable, intuitive, and easy-to-understand code. You can see in this example, we have enclosed the comma-separated String with an opening and closing braces by supplying them as prefix and suffix. You can see the nice and clean IP address generated by supplying opening and closing bracket as prefix and suffix and dot as separator. To be honest, these are just tip of the iceberg in terms of both StringJoiner and Java 8 features. I suggest you look a comprehensive Java course like The Complete Java MasterClass which covers almost everything about Java SE 8. This will allow you to get the full benefit of new API enhancement and Java 8 features in your day to day programming. That's all about how to use StringJoiner in Java 8 to Join multiple Strings. There is another alternative, you can use String.join() as well to join String. It internally uses StringJoiner for joining String but it's more versatile as it provides another overloaded version of String.join() to join elements from a String array or list of String.